New in old. 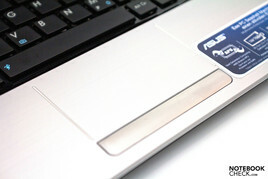 The Taiwanese Company, Asus, has also refreshed its netbook line-up and now offers the Eee PC 1215B. An AMD C-50 APU, including the dedicated AMD Radeon HD 6250 graphics, a 2 GB DDR3 RAM and a 320 GB hard disk capacity in a familiar case awaits us. The Eee-deal solution for 349 euros (RRP)? 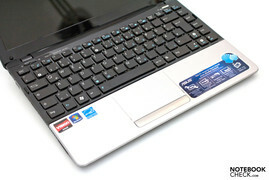 Asus had only presented the new Eee PC netbooks with AMD hardware in passing at the Consumer Electronics Show 2011 (CES). In addition to the small 1015B, a device with a 12.1 inch screen (1366x768 pixels, glare type) called Eee PC 1215B is available this year. Nothing has changed on the outsides and thus the well-familiar seashell case is still used. 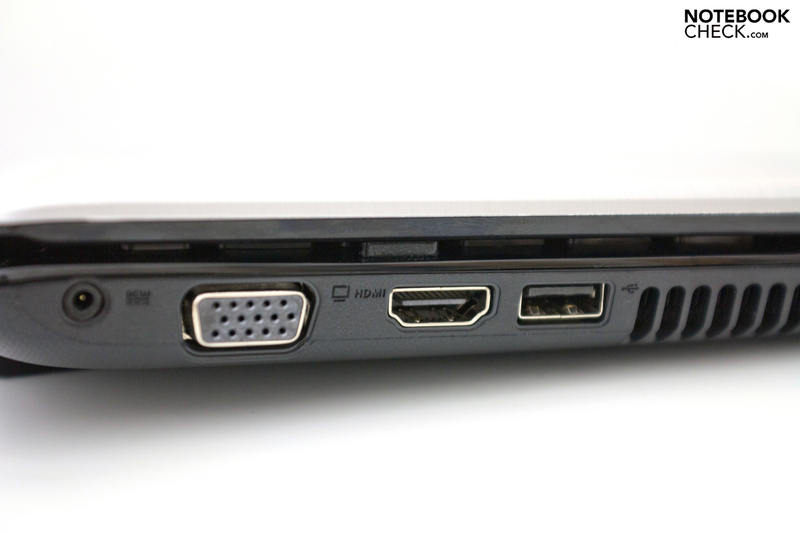 The interface array has also only been modified slightly, whereas now a USB 3.0 is installed in addition to a HDMI out. A total of three models and four different color alternatives of the 1215B intended for the German and Austrian market are to attend to the largest possible group of buyers. It had been introduced at the beginning of April 2011 (we reported). 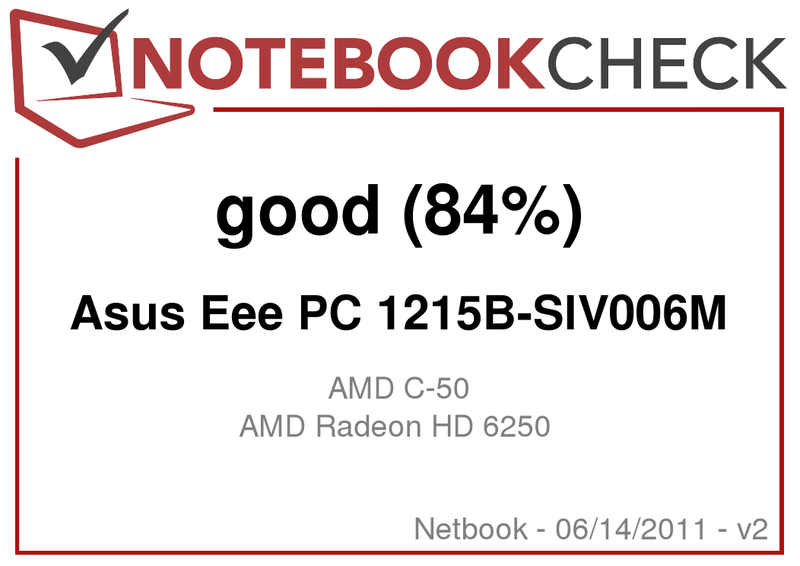 The Asus Eee PC 1215B-SIV006M that we are testing is the happy medium and includes AMD's C-50 APU with AMD Radeon HD 6250 graphics, a 320 GB hard disk capacity, a 2 GB DDR3 RAM, a USB 3.0 port and a Bluetooth 3.0 +HS module. The netbook moves in the usual range at a recommended retail price of 399 euros including added value tax. Only a minor AMD update or a reasonable enhancement of the existing range? Asus' newest sprout doesn't have any surprises in terms of design. It is still the familiar seashell case as it had already been used in various other models. The plastic used everywhere and the matt silver finish makes a good impression. However, we adversely noticed sharp edges in single parts. The looks convince with a blend of plain parts in silver and elegant inserts of black high-gloss. The Eee PC is also available completely in black (matt or glossy) or in red with a textured surface, depending on your taste. However, this decision is a matter of personal preferences. The case's stability is impressive and even stronger pressure doesn't affect the base unit. Other netbooks could take an example on this. On the other hand, the display lid isn't as resistant and only slight pressure is enough to create visible waves. Then again, this unit's torsional stiffness and tightly pulled display hinges can be seen as positive. The latter offer a good hold in the desired position with slight teetering. Opening the lid with one hand is not possible due to the low weight of 1.53 kilograms and rear positioned battery. Thus, the case has to be held down. 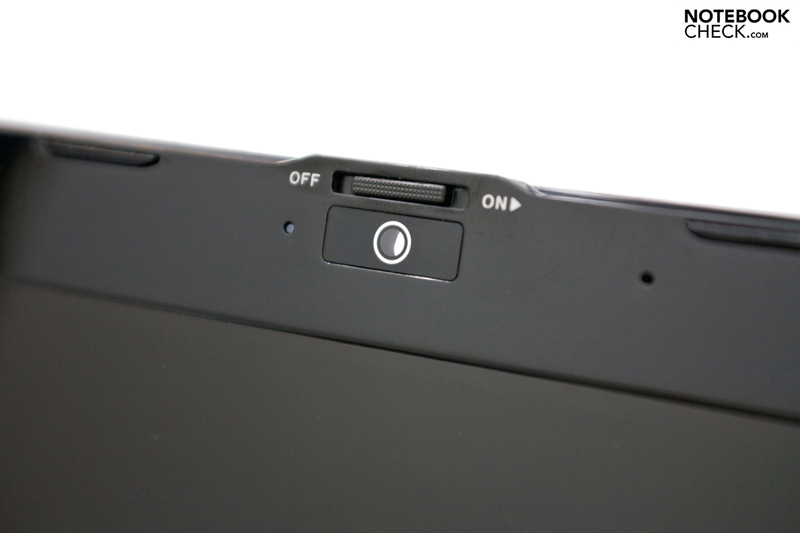 The Eee PC's bottom proves to be fairly inaccessible. 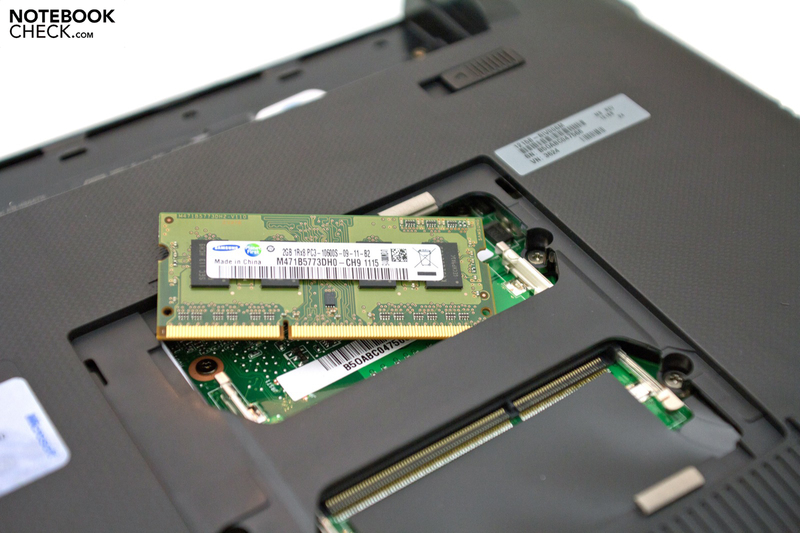 The RAM can be upgraded via a maintenance cover, whereas the maximum is 8 GB on two slots. The means of access to the memory medium is quite a bit more difficult and there is a sticker that warns you of a possible warranty loss. 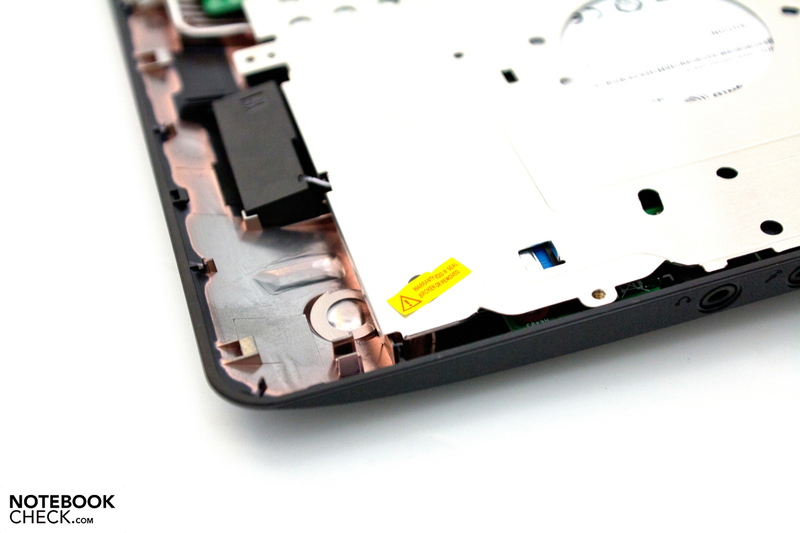 Basically, the hard disk (construction height: 9 millimeters) could be replaced, but the numerous plastic clutches on the case can break off easily and the amount of required steps make it unnecessarily complicated. 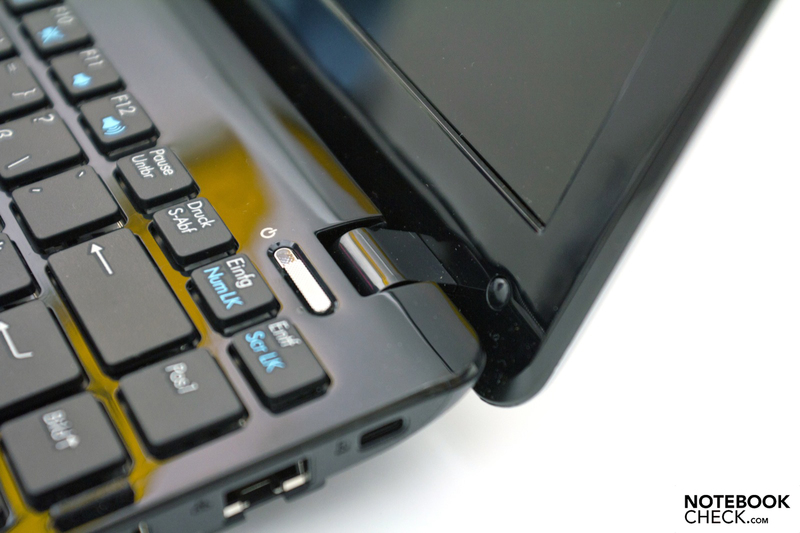 The usual interface array for a netbook is found on the sides. The pleasant distribution is also familiar. 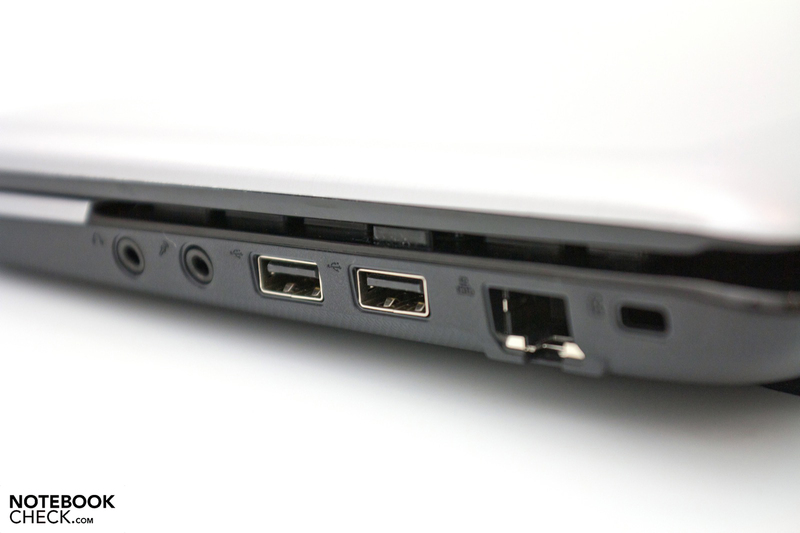 An agreeable feature is a fast USB 3.0 port besides the HDMI out. This port isn't marked as such, though. Regarding the 1215B models, it becomes apparent that only our test device for 399 euros and the more expensive device with an E-350 APU for 449 euros (RRP) have this additional feature anyway. The webcam located above the display works with the basic 0.3 megapixels and bids a still acceptable picture quality for video conferences via Skype. A small gimmick in this field is the privacy cover that can be pushed over the lens and thus provides impassable protection against impending spying attempts. Asus sticks to its line in regard to communication options and offers the latest standard. In addition to 10/100 MBit Ethernet (Atheros AR8152) and WLAN standard 802.11n, data transmission via Bluetooth 3.0 +HS is offered starting in the midrange model, which is here in the test. A UMTS model is currently not available and the required case opening also isn't equipped ex-factory. A simple and fairly inexpensive alternative is a fitting UMTS stick with a SIM card. 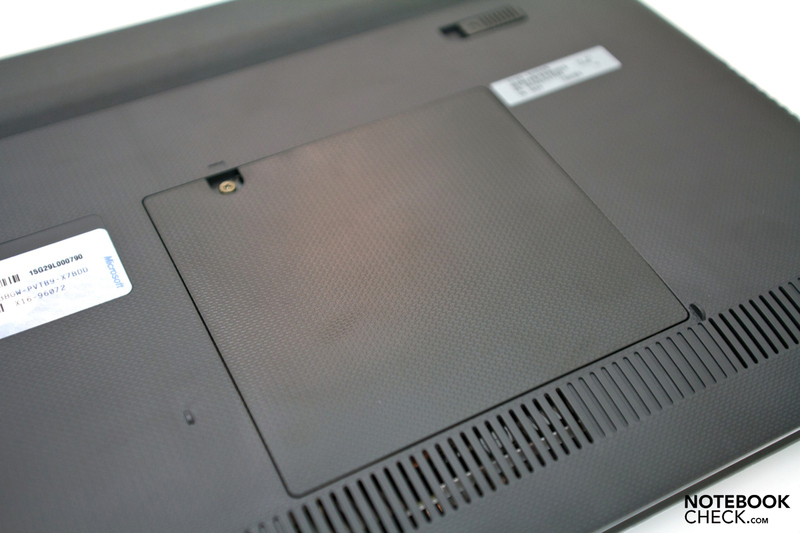 The netbook's slim packaging already hints at the moderate scope of delivery. However, this is the case in most devices of this category. 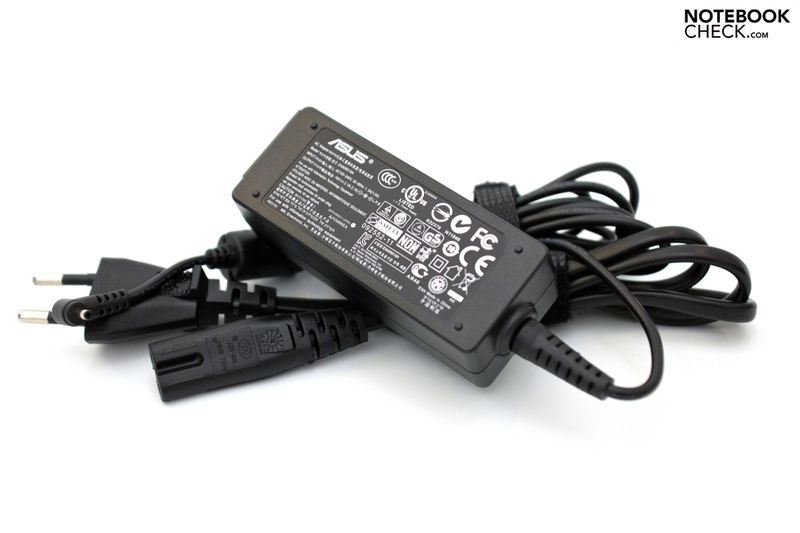 Besides the device, there is a 6 cell battery, a small power adapter with power cable and the usual documentation. Extras, such as a small bag or a mouse, aren't common for this price range and have to be purchased separately. On the other hand, the software configuration is a fortiori, even if not necessarily in a positive sense. Apart from Microsoft Office 2010 Starter and Adobe Reader, the vast amount of freeware programs and an anti-virus program's trial version are only superfluous ballast for the relatively weak configuration. 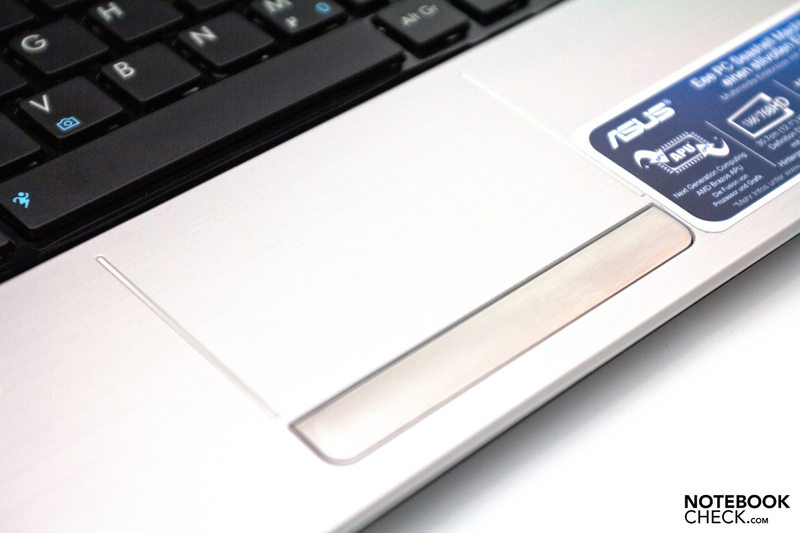 In regard to warranty, the Eee PCs from Asus match the larger devices in every way. They are delivered with a 24 month warranty including pick-up & return service ex-factory. If desired, this service can be extended for an acceptable price of around 80 euros. 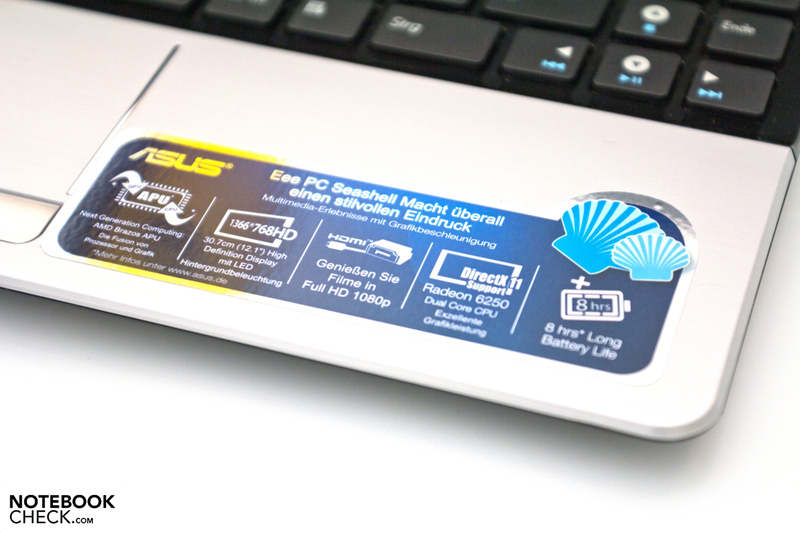 However, Asus generally only grants a warranty for the first 12 months on the included battery. 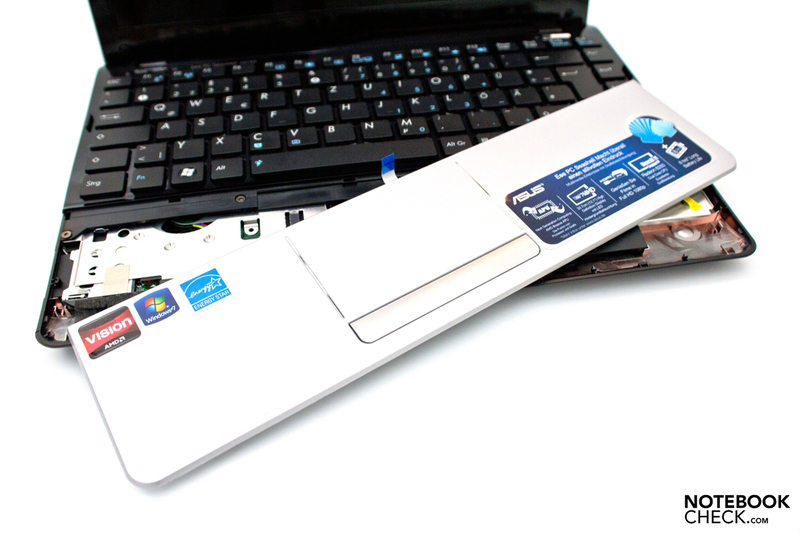 Please see our test of the Asus Eee PC 1215N, respectively the Asus Eee PC 1215T netbook with equally constructed components for details about the keyboard unit and the touchpad. 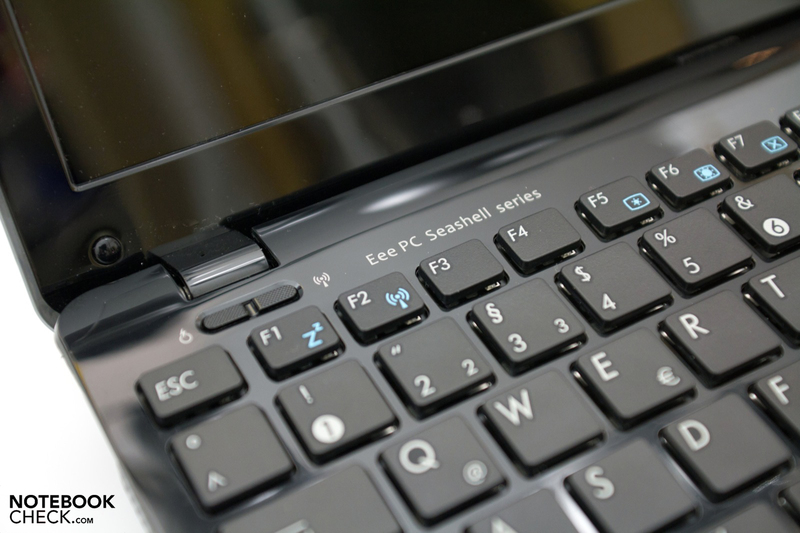 The Eee PC 1215B moves at the upper end of the netbook device category with a 12.1 inch screen. Most users prefer the usually more fine-grained resolution besides the size. 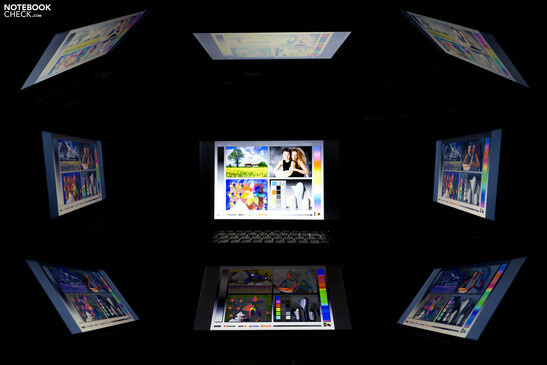 In this case, native 1366x768 pixels in a 16:9 format with a high-gloss display surface are given. Regarding the predecessors, it becomes apparent that Asus still uses the same screen from the Taiwanese manufacturer, HannStar (model: HSD121PHW1) and no improvements, such as a matt alternative, are supplied. External monitors with higher resolutions can also be connected thanks to a VGA and HDMI out. 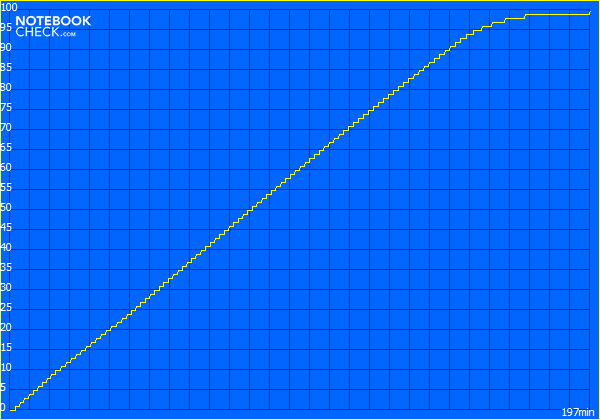 Both ports could provide a good transmission quality in 1920x1080 pixels (Full HD, 1080p) in a performance test. Small LEDs are still responsible for illuminating the entire surface. They also allow a slim build at the same time. Interestingly, our test device's maximum brightness of 203 cd/m2 is quite good. The comparable Eee PCs, 1215N and 1215T, clearly lag behind this to an extent. However, slight inaccuracies in measurement have to be considered and the question about the subjectively visible differences remains. A clear drawback is the observed brightness fluctuations which result in an illumination of only 82 percent and a visible clouding of the LED lighting. The other display rates can't keep the average impression upright. The black value of 3.95 cd/m2 is extremely high and the resulting contrast of 47:1 turns out low as expected. We can't determine if this unusual measurement is an outlier of our test sample or a problem of the range at the time of our review. The color reproduction and definition is subjectively acceptable, whereas the visible clouding has to be rated negatively. We also looked closer at the reproducible color spectrum to complement this point. The, for professional users, important sRGB reference color gamut isn't even close to being covered. This device isn't very suitable for professional use. It won't likely upset normal users as much as the image's contrast will. Last of all, outdoor use and the viewing angle stability can be summarized. The glossy surface and the average to poor brightness/contrast rates make outdoor use almost impossible. Working is only possible to an extent in a shady place. The viewing angles correspond with that of a low-cost TN screen and we notice fast inverting, respectively fading on the vertical plane. 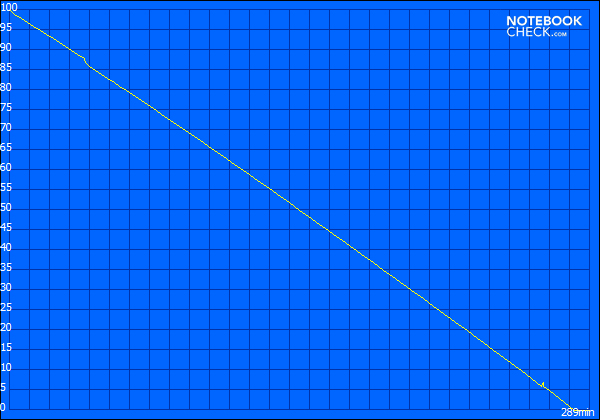 Rendering remains stable for the most part even in more narrow angles on the horizontal plane. 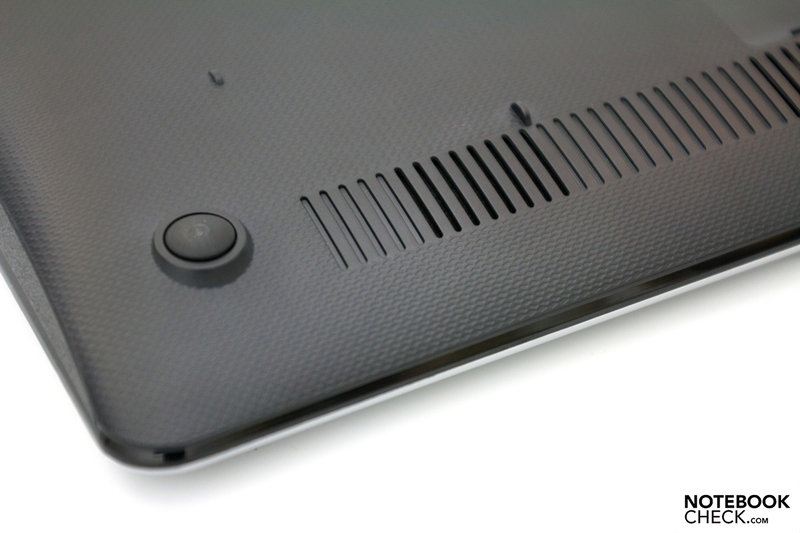 A fresh breeze from AMD blows inside the new Eee PC 1215B netbook edition. 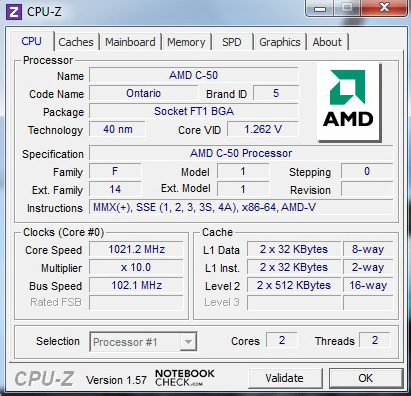 Both entry level models are equipped with the AMD C-50 Dual Core APU, which clocks with 1 GHz and has been codenamed Ontario. The 40 nanometer chip's power is distributed over two physical cores at a nominal power loss (TDP) of 9 watts. However, it doesn't include a virtual expansion (Hyper Threading) or automatic overclocking. An important key point of the accelerated processing unit is the incorporated AMD HD 6250 graphics unit with a core clock of 280 MHz and DirectX 11 support. This AMD solution is faster and, in particular, more modern in contrast to the incorporated GMA 3150 graphics in the Intel Atom N550. Even so, the actually weaker processor is of consequence. 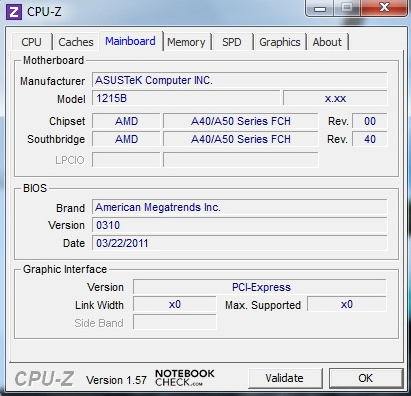 Asus however also offers the 1215B with the stronger AMD E-350 Zacate-APU for higher performance. 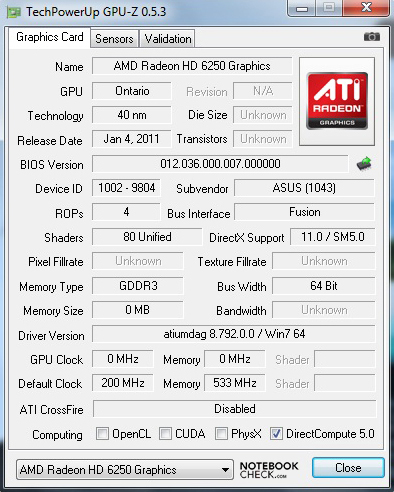 This alternative works with 1.6 GHz, two cores and an incorporated AMD Radeon HD 6310. Although this processor doesn't support virtual cores, the graphics unit is a bit superior thanks to a core clock of 500 MHz. 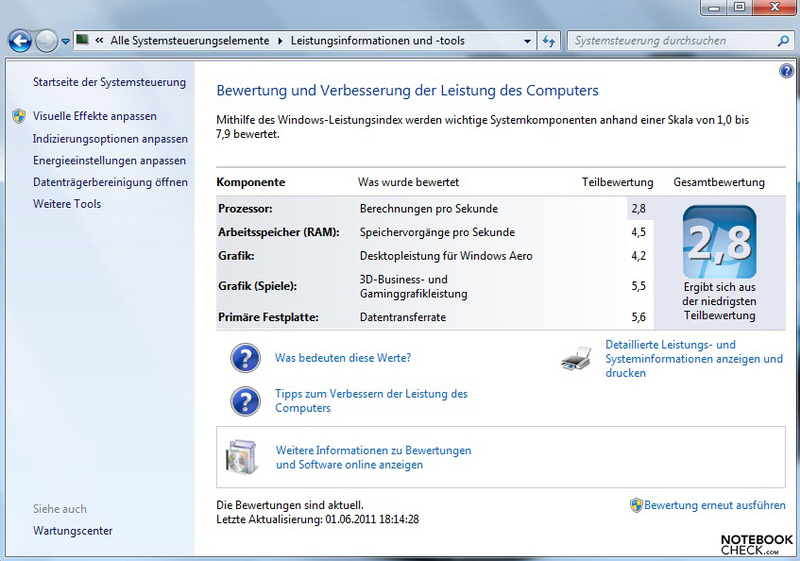 Around 50 euros have to be paid for this upgrade, which includes a 4 GB DDR3 RAM and a 500 GB hard disk capacity. The CPU benchmarks from Maxon start off our test course. The AMD C-50 APU achieves a result of 1405 points in Cinebench R10's multi-thread rendering (32bit) and thus lags slightly behind Intel's Atom N550 dual core CPU. Seen in total, it is in the lower third of our database. An example with the Intel chip alternative would be the HP Mini 5103 with a result of 1457 points (difference: +3.6 percent). 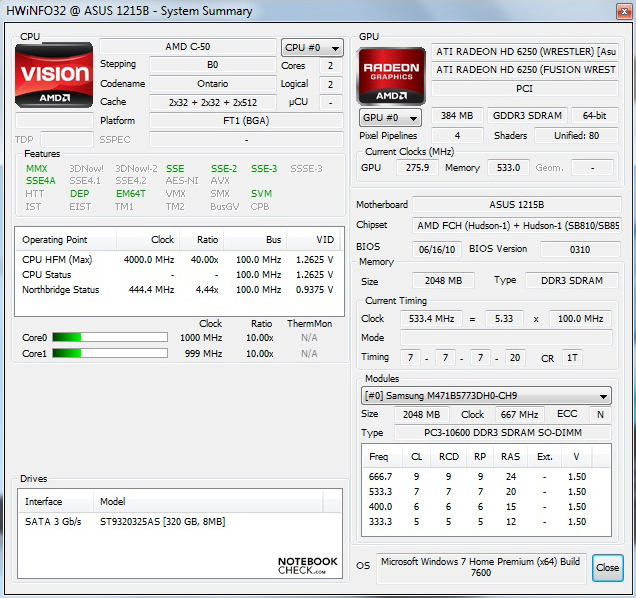 The AMD E-350 APU is available for a surcharge and a bit stronger with a core clock of 1.6 GHz. The Acer Aspire 5253 achieves 1957 points in this test and has a lead of 25.6 percent on the N550 and 28.2 percent on the tested C-50 APU. Netbooks with an Intel Atom N550 fall through the cracks of the newer Cinebench R11.5 because these configurations are only delivered with Windows 7 Starter (32bit). This benchmark is executed in 64bits. 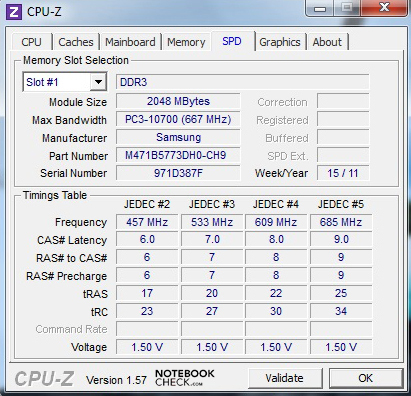 A difference of 33.3 percent (0.4 to 0.6 points) results in comparison with the Acer notebook with an E-350 APU in this test. 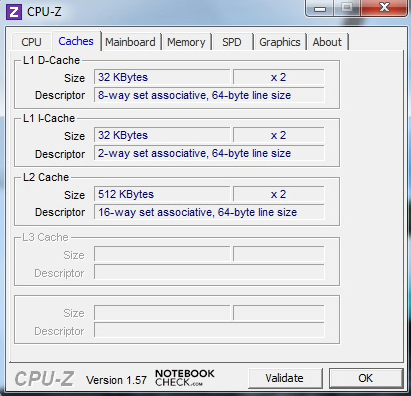 All in all, a typically weak performance for a netbook, that is also noticed in routine use. Opening windows is quite slow and the charge times aren't impressive, either. Nevertheless, Intel practically moves on a par with its N550 CPU. The incorporated AMD Radeon HD 6250 is faster with a core clock of 280 MHz and also technically more modern than the Intel counterpart in the N550. But it is still no guaranty for a convincing 3D performance. The GPU achieves a result of 1399 points in 3DMark06 and clearly surpasses the Atom N550 with a GMA 3150 graphics. 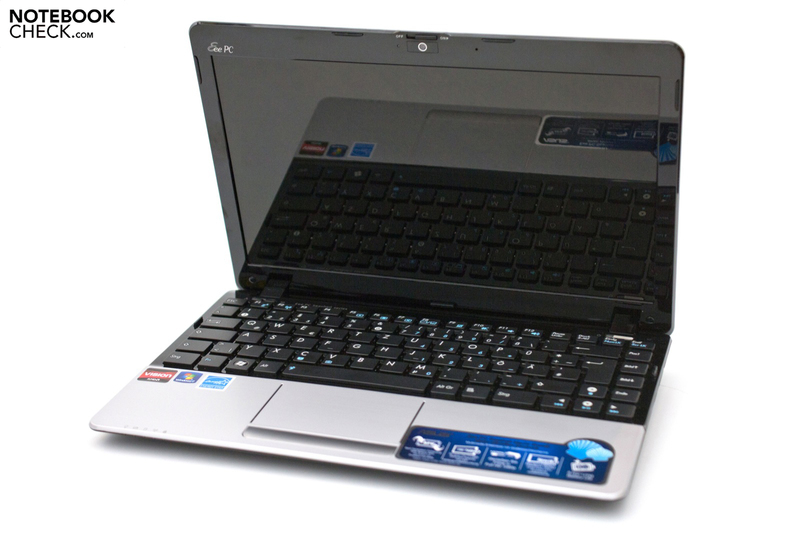 The Asus Eee PC 1015PEM, for example, only reaches weak 147 points in this benchmark. Thus, it lags behind by a whole 89.5 percent. 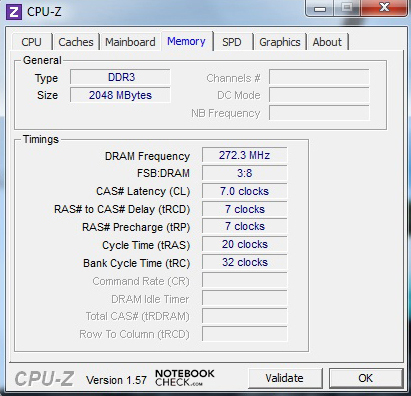 The Acer notebook with an AMD Radeon HD 6310 (E-350) is faster with its core clock of 500 MHz and achieves 1987 points (difference: +29.6 percent). Furmark's system benchmarks bid a small performance verdict. 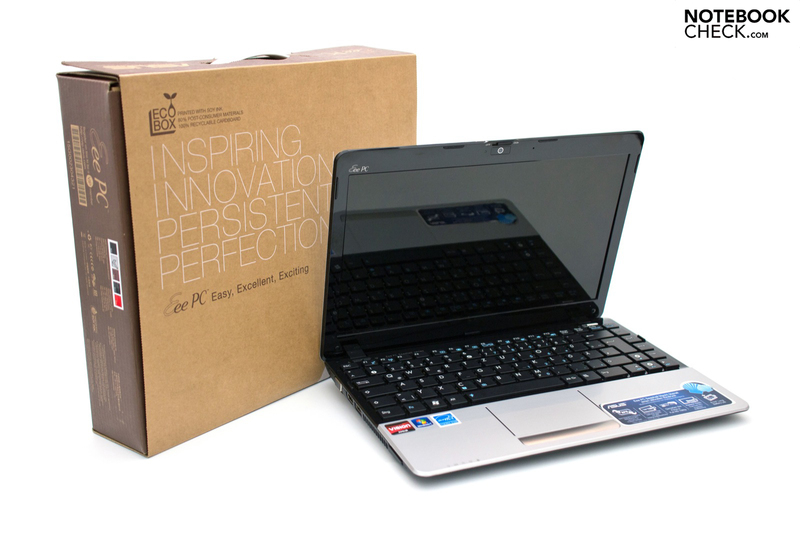 The Eee PC 1215B achieves a total score of acceptable 1788 points in PCMark Vantage. However, it is also in the lower third of our database. The immediate AMD predecessor, Eee PC 1215T, is only a breadth away and even netbooks with Intel's Atom N550 are direct neighbors in comparison. The Samsung NF310, for example, reaches 1671 points, which results in a difference of only 6.5 percent. 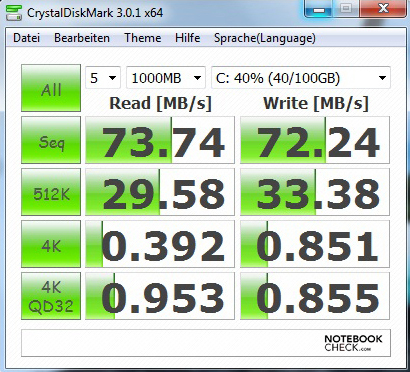 The E-350 APU is faster as usual and the difference is 12.5 percent with 2044 points (Sony VAIO VPC-YB1S1E/S). A 2.5 inch hard disk from Seagate, with today's standard capacity of 320 GB, serves as data memory. The installed Momentus 5400.6 places itself in the usual performance midfield with a work speed of 5400 rpm. The maximum read transfer rate of 72.2 MB per second (CrystalDiskMark) and the access speed of the AS SSD benchmark confirm this statement. 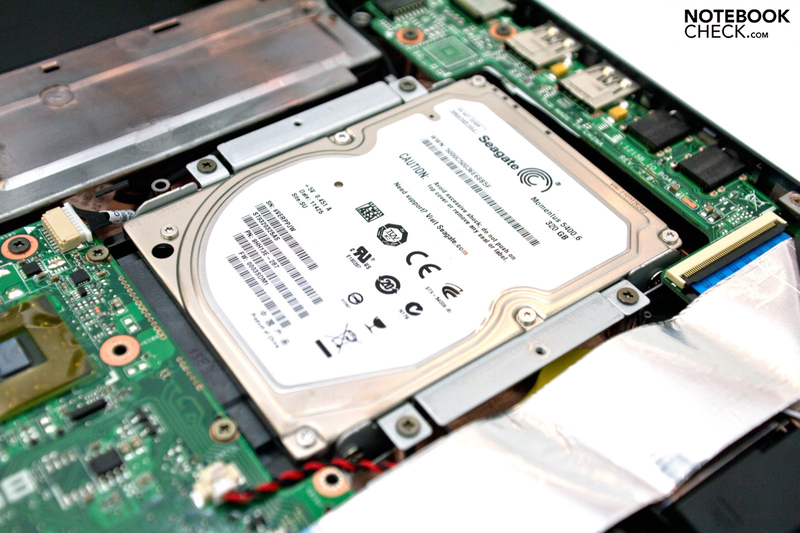 Replacing it with a stronger alternative in form of a hybrid drive or a SSD is possible with some effort. However, it's not recommendable for lay persons. 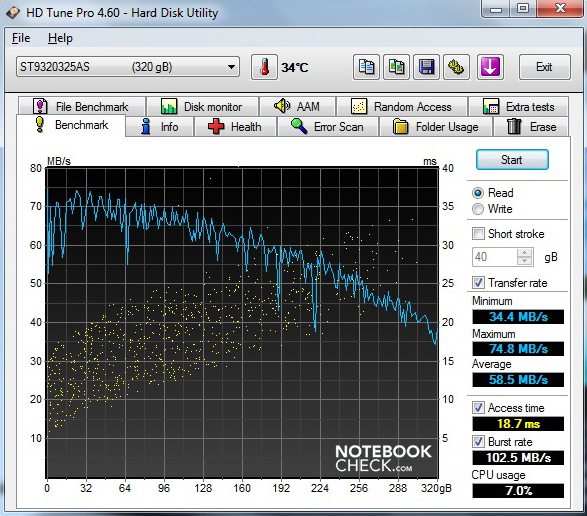 Moreover, it has to be considered that SSDs with eSATA II connections aren't supported by this platform (Intel SSD Serie 510, OCZ Vertex 3) and thus Intel's new SSD series 320 is sooner to be recommended. 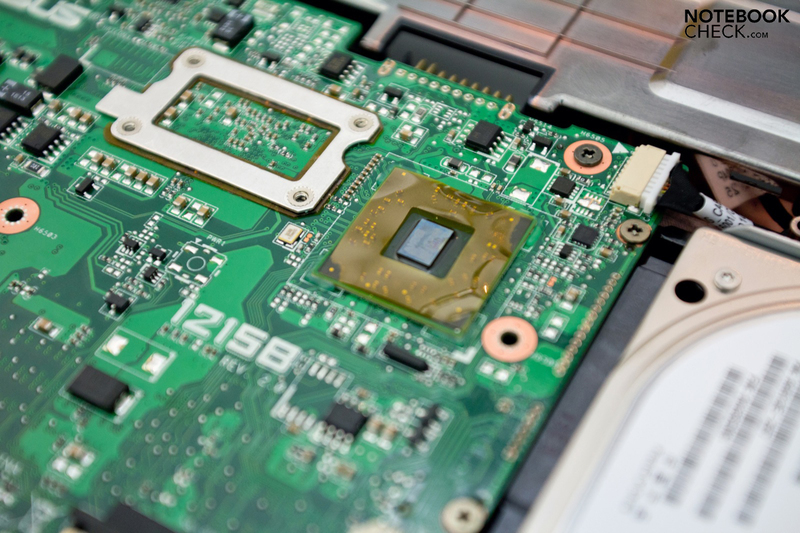 A small case fan and the installed memory unit are responsible for the created noise level. 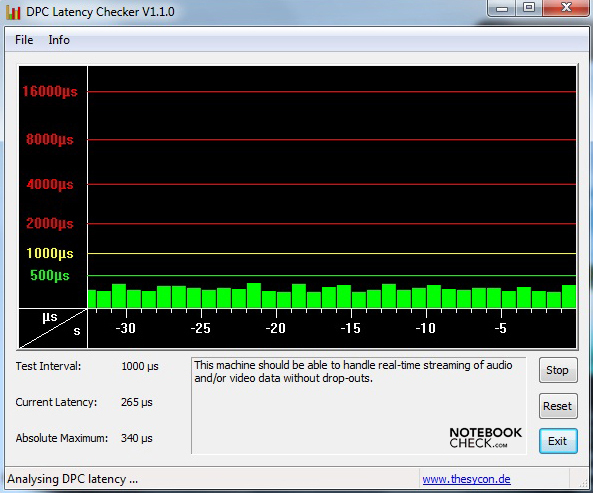 The netbook stays in the background with a constant 31.4 dB(A) in idle mode. However, the permanently running fan is clearly a point of criticism. Other systems prove that silent operation in office applications is possible. The installed hard disk doesn't show any irregularities with 32.7 dB(A). The operation in load surprised us at a later stage. The low level of constant 31.4 dB(A) could be maintained even during demanding applications. The fan's revolution speed normally increases significantly during these measurements in most cases. The temperatures on the case's top are all within an acceptable range and the low maximum of 32.6 degrees Celsius convinces. The subjective feeling of these rates ranges from pleasantly cool to lukewarm depending on the scenario. 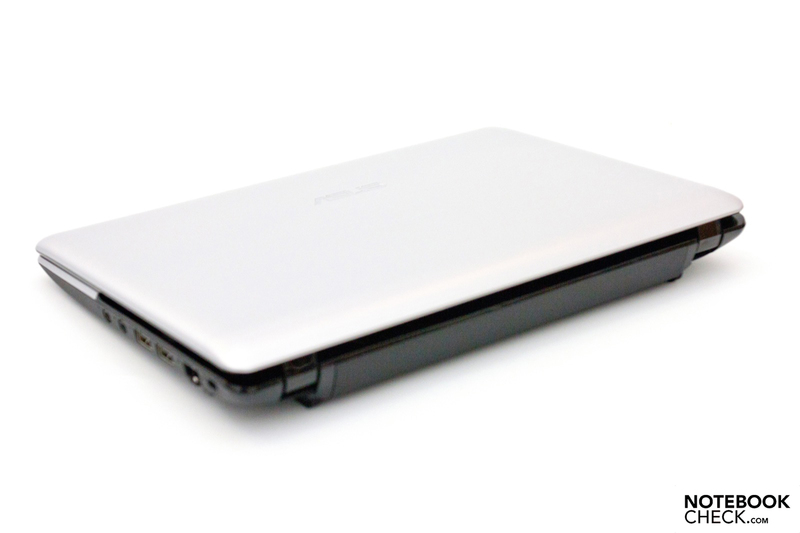 Overall, the netbook delivers a impressive presentation that doesn't need many words. (+) The maximum temperature on the upper side is 28.1 °C / 83 F, compared to the average of 33 °C / 91 F, ranging from 21.6 to 53.2 °C for the class Netbook. (+) In idle usage, the average temperature for the upper side is 25.8 °C / 78 F, compared to the device average of 29.8 °C / 86 F.
(+) The average temperature of the palmrest area of similar devices was 29.3 °C / 84.7 F (+2.4 °C / 4.3 F). The installed stereo loudspeakers' sound quality is rather modest, as expected. Only few netbooks can impress in this field. A good example would be the Toshiba NB550D (also based on AMD) with a 10.1 inch screen and two speakers from Harman Kardon located in the wrist-rest. External solutions can be connected to the 1215B via the 3.5 mm stereo jack or the HDMI socket for a better sound. In addition to various headphones, an AV receiver with HDMI connector worked flawlessly in the test. Low power consumption, a relatively small screen and a suitably sized battery are important points for impressive battery runtimes. 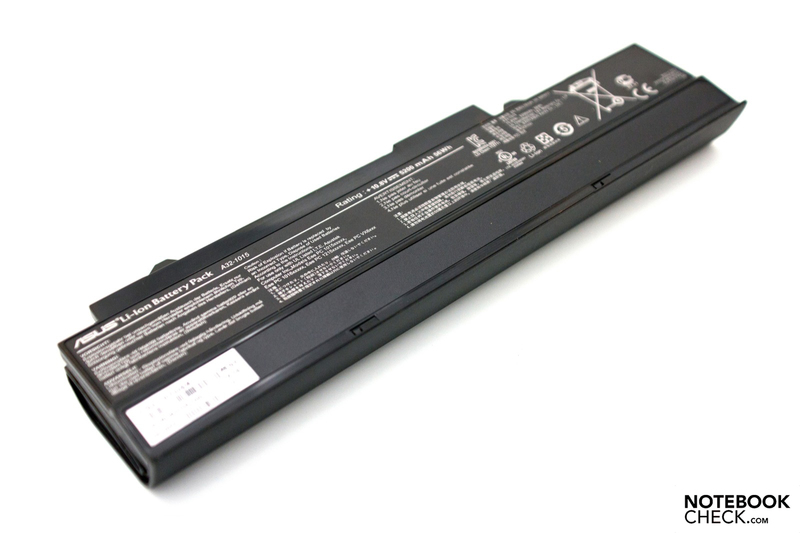 The latter bids a capacity of 56 watt hours in 6 cells, whereas it is Asus' standard netbook battery. BatteryEater's Classic Test simulates the hardware load during maximum display brightness and enabled WLAN modules. A complete battery charge is drained after good 4 hours and 49 minutes in this scenario. BatteryEater's Reader's Test is the opposite measurement. Reading a text document is replicated in this case (max. energy saving options). The assessment is finished after 11 hours and 49 minutes. In comparison, the Eee PC 1215B is in the upper third, whereas this device category also has room upwards. More often than not, both of these scenarios aren't true to life because only the mostly used short term extremes are shown. The practical measurement "surfing via WLAN" with a pleasant display brightness is usually the happy medium. The netbook delivers a convincing presentation with 7 hours and 26 minutes, which is nevertheless within the average range. Lastly, we also looked closer at the charging process from a capacity of 0 to 100 percent. Unfortunately, this process is rather long with 197 minutes (3 hours and 17 minutes). The system's consumption rates are logical and fit in the picture when looking back at the runtimes. Our test system even surpasses small netbooks with an Atom N550 with a maximum consumption of only 9.9 watts in idle mode. However, the consumption during load is usually a bit higher at the peak with 17.3 watts. Overall, there is no reason for complaint in view of the large 6 cell battery, though. The Asus Eee PC 1215B, with the new AMD C-50 APU and incorporated AMD Radeon HD 6250 graphics leaves us with mixed feelings, as already the direct predecessor did. The case is still very stylish and the stability as well as workmanship is good – although we find that it lacks a bit of attention to detail. The connectivity has also been modified and there is now a USB 3.0 port installed. 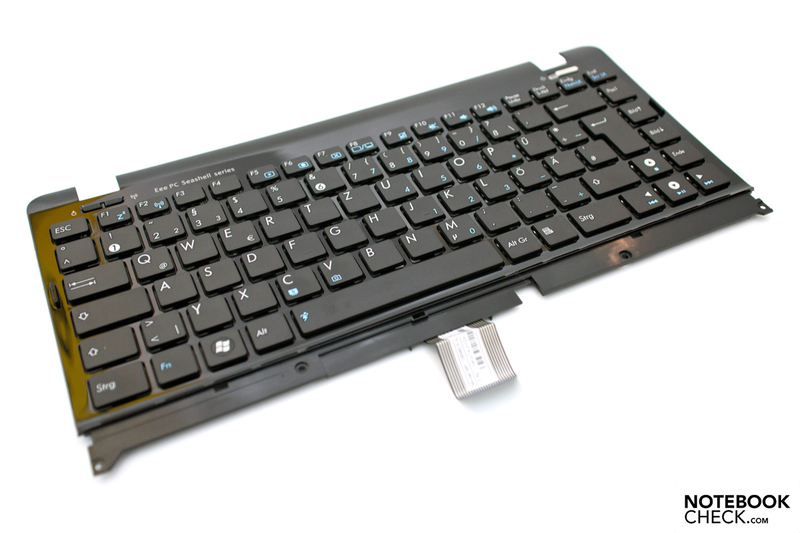 We believe there is need for improvement in the below average screen and the touchpad area with slightly stiff keys. In terms of performance, the Brazos platform (C-50) is no longer new and, with exception of 3D performance, Intel's Atom N550 is still in the lead, even if insignificantly. The emissions and the battery runtimes subjectively make a good impression, whereas we have to complain about the permanently running fan as well as the stereo speakers. Basically, you get a modern typewriter with well-known strengths and weaknesses for 399 euros (RRP, midrange model), which is available as the model Asus Eee PC 1215B, but also with an Intel Atom N550. The generous keyboard, the good battery runtimes and the low noise and temperature emissions. Better workmanship in details and a considerably better display with matt surface. The continued use of the meanwhile outdated case without improvements and the permanently running fan. 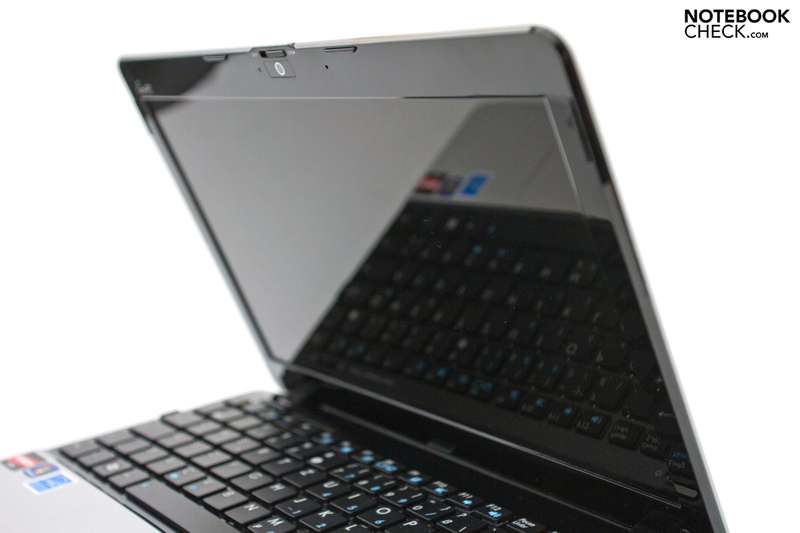 Newer netbooks with 11.6 or 12.1 inch display are scarce on the market. 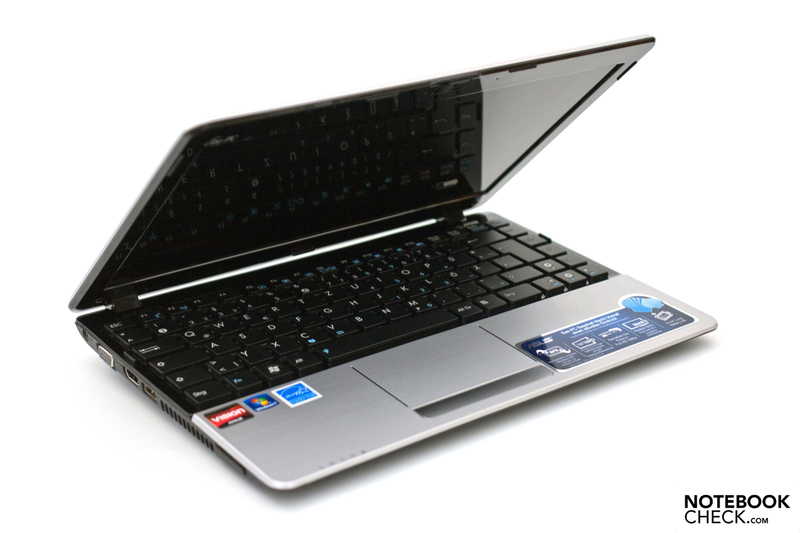 However, alternatives would for example be the Acer Aspire One 722 or the HP Pavilion dm1-3180eg netbook.